PLEASE USE THE EMAIL ADDRESS YOU INITIATED YOUR TRANSACTION WITH, OR REFERENCE IT IF YOU USED A DIFFERENT EMAIL FOR YOUR TRANSACTION. 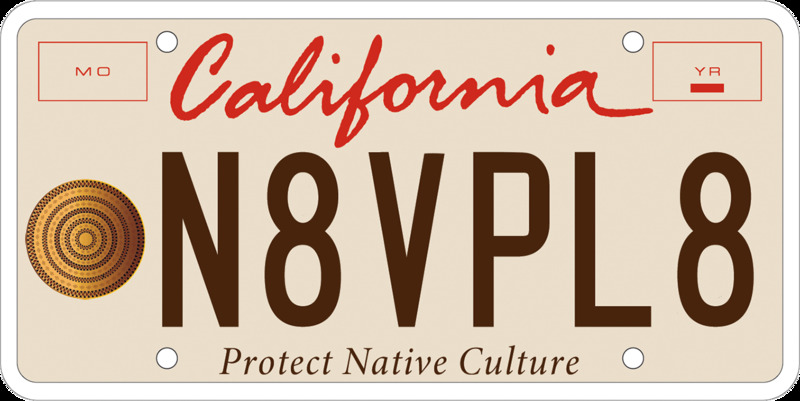 You can cancel at any time prior to the issuance of your ‘Protect Native Culture’ license plate. YOU MUST PROVIDE NOTICE IN AN EMAIL, NOT BY TELEPHONE, SO WE HAVE A WRITTEN RECORD OF YOUR REQUEST. If an error has occurred in the issuance of your plate and/or registration, we will do everything in our power to correct it, subject to applicable policies and guidelines provided by the California Department of Motor Vehicles (DMV). 1. Sequential (sequential plate series) plates will be issued directly to plate applicants. The vehicle the new plate will be assigned to must be currently registered. a. All original ELP configurations will be manually reviewed to determine if the plate meaning meets the Code of Regulations, Title 13 provisions. b. If unacceptable, a refund will be issued to the applicant and a denial letter with an explanation issued. c. If acceptable, the ELP reservations will be made and orders will be forwarded to the California Prison Industry Authority for manufacturing. NOTE: This will add an additional 8-12 weeks to the process. d. Once plates are manufactured, the plates will be mailed to the field office or auto club the applicant designates. The field office or auto club will notify, once plates arrived in the office. The vehicle the new plate will be assigned to must be currently registered. Note: it is unlawful to provide false information to obtain a license plate.